The vinyl record has made an impressive comeback in recent years. It offers not only a collectible element in its big, bold, artsy sleeve, but also both the return of the front-to-back album experience and an arguably richer and warmer sound than its digital counterparts. Producing vinyl records is an arduous and detailed process, from the creation of the original copy of the music (or master recording), all the way down to printing and pressing the hundreds of duplicates required to entertain your fans. Place the lacquer-coated aluminum disc on the lathe (the machine that records your music to the disc). This disc comes with a protective band wrapped around the outside; make sure this is removed. Place the lathe's vacuum line in the center of the disc to keep it in place. Position the lathe's cutter and microscope above the disc and begin a test cut around the outer rim of the disc, while checking under the microscope to make sure the cutter is properly aligned. Once the cutter is in its proper position, begin cutting from the outside-in, and play your attached recording through the lathe from front-to-back. This will transpose your music into tiny grooves onto the lacquer disc, which must then be used to create a metal mold. Wash the disc gently with soap and water, then spray with tin chloride and then liquid silver. Wash away any remaining silver that did not adhere to the disc. This will create a thin, silver mold of your lacquer recording. The silver mold is still too delicate to use for pressing copies, so you need to reinforce it with nickel. Activate the electrically charged water tank and dissolve the nickel into the water. Make sure the nickel is fine-grained in order to avoid creating distortions in the mold. Attach the disc to the spindle underneath the lid of the tank and activate the spindle. Rinse a final time, then dip the disc into the water to fuse the nickel and silver together. Remove the disc from the tank, separate the metal mold from the lacquer disc and dispose of the lacquer disc. Place the mold onto the optical center punch, find the center of the disc using the punch's microscope and then punch a hole into the center of the mold. Remove the mold from the optical punch and place it onto the trimming machine to remove excess edges, cutting the disc to 32 cm in diameter. Attach the mold to the record press, pour the polyvinyl pellets into the press's hopper and place your printed and cut labels into the machine. Activate the press. The press will stamp the polyvinyl and the labels together, using the metal mold as the template. It will then cut away any excess edges that are leftover, and out will come the finished vinyl records! Use the mold and the record press to create as many copies as you need. 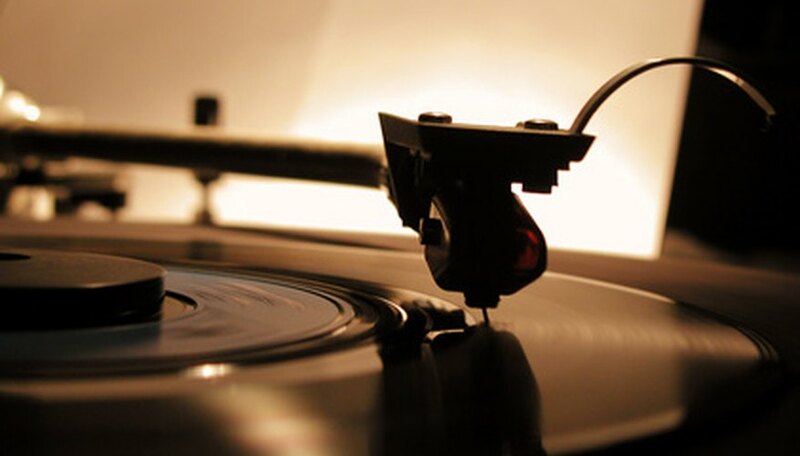 Creating vinyl records is a very delicate task, and completing any of these steps requires a level of professional training (especially cutting the master recording). Unless you have experience performing these tasks, it is recommended that you seek professional assistance in pressing your music to vinyl. Residing in Toledo, Ohio, Darhel Baker has been writing both articles and advertisements for the region's music scene since early 2008. His work has been published by both "Matrix Concerts" and IGUN (Industrial Gothic Underground Night), and has been read on various radio stations throughout the mid-west. Darhel is currently pursuing an associate's degree in music business technology at Owens Community College. How Does a Vinyl Record Work?